A New York couple has been missing for two weeks following a holiday to the Dominican Republic, according to their family. 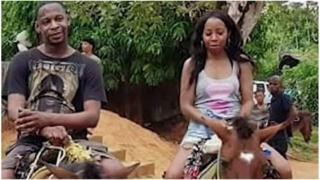 Portia Ravenelle and Orlando Moore were to return on 27 March from a four-day trip to the resort town of Samaná, but they never boarded their flight. The pair has not been heard from since they reportedly left for the airport in a rental car at the end of their trip. Local police are investigating and US officials are aware of the case. During a Tuesday news conference, Dominican Republic National Police spokesman Col Frank Felix Durán Mejia said authorities are not yet able to say whether the couple was kidnapped. Col Mejia said the couple's rental car, a white Kia, has not been found, but they have confirmed that Mr Moore and Ms Ravenelle passed a toll booth on the way to Santo Domingo at 01:41 on the morning they were scheduled to depart. The US embassy in Santo Domingo did not immediately respond to a request for comment from the BBC, but a Department of State official said they are "aware of reports regarding a US couple missing in the Dominican Republic". Mr Moore's sister, Lashay Turner, told NBC New York that US customs officials confirmed Mr Moore did not return to the country. She said their car remains parked at the Newark airport where they left it on 23 March. The couple, of Mount Vernon, New York, stayed at the all-inclusive Grand Bahia Principe Cayacoa resort in Samaná from 23 March to 27 March. Tourist Cheryl Freeman, who says she stayed at the same resort and befriended the couple, told CNN Ms Ravenelle had been worried about using a rental car, making sure they had enough petrol and that GPS devices were charged. She said the pair had been warned by the rental company not to open their windows for any local people due to crime. The US Department of State lists the Caribbean island nation under a level two travel advisory, warning tourists to exercise increased caution as "violent crime, such as robbery, murder and sexual assault, is common". Ms Freeman last heard from Mr Moore and Ms Ravenelle the night before their scheduled departure and said the couple did not reply to messages sent after that evening. The family also told local media that both Mr Moore and Ms Ravenelle stopped sharing photos or responding on social media around that time. Ms Turner told NBC that her brother is a father and would not "run off on a hiatus". "I'm scared. I don't know what's going on."